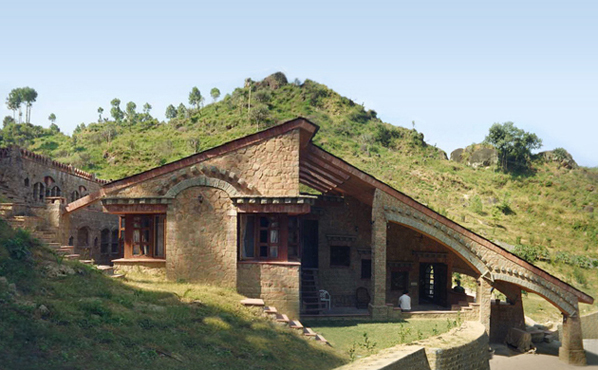 This 2100 sq ft weekend retreat on a 3 acre wooded site is situated 3200 ft above mean sea level on the breathtaking Himalayan foothills. Built by hand by local craftsmen and designed using innovative building techniques inspired from the regional vernacular, it maximizes the passive use of the building form and materials to collect, store and distribute energy while minimizing its environmental impact. Some details were developed and refined on site after testing and building full scale models. The compact design laid over three naturally terraced levels of the site topography accommodates a master suite, kitchen and living area that open onto a paved patio and a shaded verandah. The house is linked to upper terraces with sandstone treads, revealing the inherent quality of the landscape. An innovative integrated system of 18” thick rubble masonry cavity walls filled with rammed earth from soil on-site was employed as wall construction as the most environmentally sound, thermally massive material available locally from a neighboring quarry. Coupled with stone clad concrete floors and insulated slate clad roofing, it acts as a heat sink to neutralize seasonal and diurnal temperature fluctuations which can be as high as 100F in summer and near freezing in winter. Roof insulation, recessed windows and doors, passive ventilation and thermal mass radiate warmth in the winter and keep the house cool in the summer. PVC is eliminated by using galvanized metal electrical and plumbing conduits placed in chases cut in the stone, covered in plaster veneer tainted with brick dust. The interior finishes are natural materials including non toxic lime based paint, local wood ‘talli’ used for windows and doors, stone clad stairs and floor all contributing to good indoor air quality (IAQ). Waterways collect storm water through a system of natural water channels depositing the storm water in a retention basin at the base of the hill. The rocky outcrops allow aeration by dropping the water over rocks, filtered over pebble beds. The reservoir releases stored water, irrigating the vegetable gardens during the dry months.